When I tell people that I work from home and have for over 10 years these are the comments I hear. My response? Actually it is harder for me to turn off my work and get the housework done. Just ask my husband. He will tell you all about it! For most people working from home sounds like a dream. There are definitely perks that is for sure. I don’t have to sit in rush hour traffic. I can work in my sweatpants all day if I chose to (and some days I chose to!). I rarely ever put on makeup which is a nice bonus. When it is nice outside in the summer I can work on my deck. I live in Minnesota– I have to take advantage of those nice days! And one of my favorite bonuses of working from home is that I never have to put on shoes. That being said working from home is a lot harder than it looks. There are days I go without any adult interaction and that can be lonely. Sometimes I do miss wearing business clothes and looking put together. Then there is the fact that I am always home. 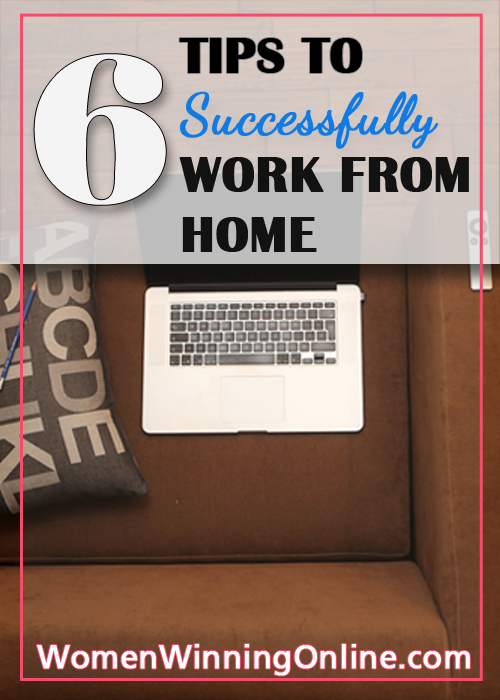 So how do you work from home, do it successfully and enjoy yourself? Here are my 6 tips to making it work. For me time blocking is a critical piece to working at home. When you have a job in an office you have set working hours. I create the same working hours while working at home. Every night before I go to bed I figure out my working hours for the next day. Because I have three small kids the working hours change from day-to-day. I put in my calendar work time, family time and me time. Then I schedule tasks for each time block. Time blocking is a great visual reminder that I have set working hours and to keep the work in those hours. One challenge that I fight everyday is to stay focused during my set working hours. Time blocking has helped with this but I still struggle with staying focused. You know how it is when you are working on a blog post. You run over to Facebook to check one thing or you check your email in the middle of writing and it happens. You are down the rabbit hole. Before you know it 30 minutes has passed and your blog post is still in the same spot. Ugh! Don’t you hate when that happens?! When I do my time blocking I set tasks to complete within a 15, 30, and 60 minutes time frame. Then I hold myself accountable. I put a timer on my phone to get the task done. When the timer is up and I am finished only then can I visit the rabbit hole Facebook or check my email. I think it is critical to have one dedicated working space when you work from home. This makes it easier to stay organized, stay focused, and turn off your work mind at the end of the day. This needs to a be a work space that is just yours and yours alone. No school papers, coloring books or bills allowed! Having a designated work space also makes it easier to get in the right mindset when you sit down to work. I have tried working from the couch and I feel sluggish when I do that. I am more motivated and productive when I have a work space I can call my own. Having a designated work space in our home has been a challenge for me. I had a room with a door which was wonderful until I got pregnant with our son. In came baby out went my office. Since then I have worked at our kitchen table, in the basement, in the door-less formal dining room and finally in our master bedroom. I find that I need an area with a door so I can close it and focus on my work. There are so many solutions out there for home offices. If you need inspiration check out some ideas on Pinterest. I think it is important to get out of the house when you work in your house all day long. One of my favorite destinations is a coffee shop. Good coffee, free WiFi and a bit of adult interaction will often cure me from the sameness of working at home. A change of scenery is good for the mind. It helps energize me and motivate me to get my work done. Plus the bonus of treating myself puts me in a positive mood. The great part about working for yourself is that you can go anywhere to work. If it’s nice outside go find a park and write a blog post. Or check out the local library for a space to work. There are many options other than your home where you can get your work done. You might even find some inspiration and motivation in these places! This goes back to the beginning of the post. So many people I talk to say they couldn’t work from home because they would do housework instead of work. Yes that is a real temptation. It is easier to clean during the day when you have more energy. You think “Oh I will just clean the kitchen and then get to work.” Five hours later you have gone on a cleaning rampage and have a nice looking house but your work is left undone. How do I avoid this scenario? Two ways. First I allow myself to do small tasks during the work day. Not big tasks like cleaning the kitchen, but smaller tasks like throwing in a load of laundry. If a task will take me 15 minutes or less I will do it. I remind myself that this is one of the perks of working from home. I can do small tasks that will make my family’s life easier. The second way I avoid cleaning instead of working during the day is I ignore the mess. I would love to say my house is the epitome of a clean house but that just isn’t true. I have three small kids. Most days my house borders on natural disaster. I have to ignore it during the day otherwise I can’t work. I have my designated working space in our house and I make sure that area is clean and organized. It makes it easier to ignore the other imperfections around the house. Do me a favor will you? Right this second give yourself a pat on the back or a hug. Seriously do it. I want you to remember to give yourself a break. All too often we as women are hard on ourselves. We run around doing so much for others and very little for ourselves. At the end of the day we make a list of what we didn’t get done and feel bad about ourselves. Instead we should make lists about what we got done and give ourselves a pat on the back. Give yourself a break! Give yourself credit and realize that you are doing better than you think at balancing work/kids/husband. Working from home isn’t always easy but it is fun! To get the full benefits of working from home you have to learn to balance your personal life with your work life. To do this you have to designate your working time and place during the day. It is important to take time away from the house and interact with the real world. Finding a healthy balance is the key to working from home and being successful in both business and your personal life! What are your tips about working from home? How do you find a healthy balance or is this something you are still working on? Please share your thoughts in the comments below! I also linked up this post here! 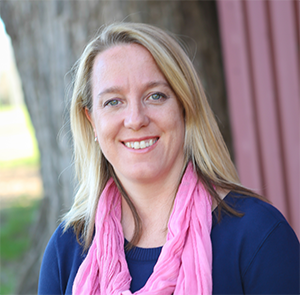 Hi I'm Jen: Wife to one great guy, mom to the best 3 crazies a woman could ask for and a business owner. My passion is to help women build and grow their online business, so they can have the flexibility to do the work they love while spending time with the people they love. Join in the conversation on my blog and learn how you can do just that! I Started a Blog…Now What?! Thank you so much Jessie! I don’t know what it is about that timer but it motivates me. Probably my Type A personality feeling the need to be competitive– even if it’s a timer :). It is just too easy to fall down the rabbit hole these days between Pinterest and Facebook. I’m glad I’m not alone with my office in our master bedroom. We finally bought a house with room for an office for me and hello surprise baby! I do my best to keep this area clean so that helps. Thanks for your comment Stephanie and the compliment on my post! I am amazed how much a change of scenery is crucial to my creative process. In fact I was STRUGGLING to come up with a name for this blog for like a month. It was killing me. Then I decided to take myself to Starbucks after the preschool run and Boom the name hit me like a ton of bricks. Sometimes it’s just good to get out and be in the real world even if it is just for an hour. By the way I love your website! Beautifully designed! Leave the house! GREAT tip! This is one I have to intentionally do every day. Before I had a child and I worked from home, I went pretty much every day to work somewhere else. But that’s not possible now. So, we go for a walk every day. Often to the store where we can interact with people! 🙂 This is a really helpful list. I’ll be pinning. Thanks! Thank you so much for commenting Inez! Yes leaving the house for me just changes my whole mental state. It really helps me start to get my creativity flowing if I am stuck. That is so great that you can walk everyday! I am jealous. In MN we don’t have that luxury. Thanks again for the comment and the pin! Thank you so much for your comment Kate! And I would love to link this up on your site. I will do that this evening! The den sounds like a great option to start with especially if you can sneak in some work during playtime. Another thing I am working towards is having all my work files digital and in the cloud so I don’t have to worry about bringing a paper trail with me. Thanks again for the comment! I’m excited to link up on your site– thanks again for asking! Thank you so much and thanks for your comment! Just yesterday I was so burnt out of being at home and a 2 hour trip to Starbucks made all the difference! I can’t wait until it is nice out and I can actually work outside. Those are the best days! Sadly I have always been good at ignoring the mess when I am working. In my early days of working at home my husband could never understand why I didn’t clean the house at the same time. I had to explain to him several times that I am W-o-r-k-i-n-g not cleaning. Thankfully he understands that much better these days! Click Image To Find Your Tribe!